Goku is back and he’s up against Sonic! Sonic may have thought that he was the fastest thing alive, but Goku is far faster. He’s got the Kamehameha at the ready and Sonic won’t be able to stop them. 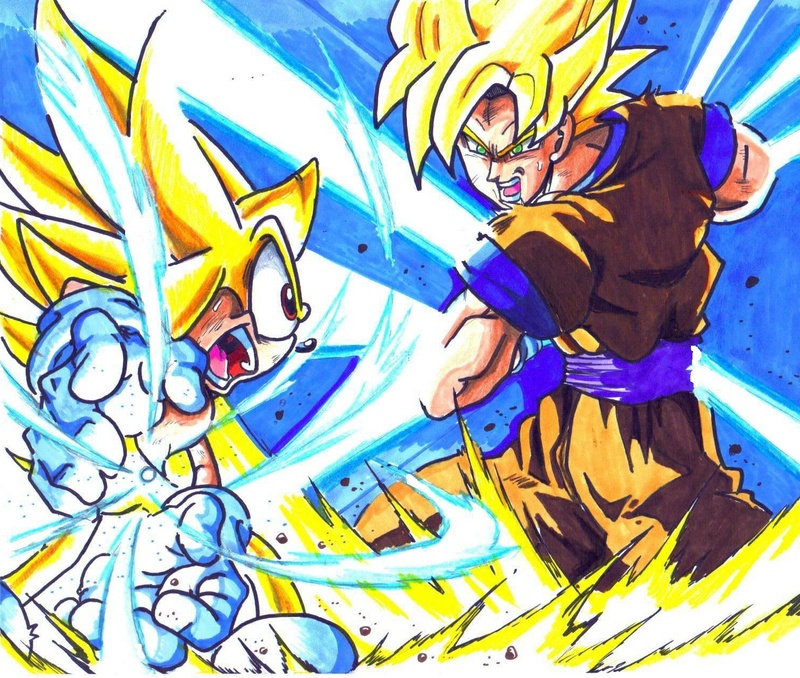 They both share many powers and abilities, but Goku is far superior with them. Goku wins. This entry was posted in Battles, Goku Battles, Sonic Battles and tagged Goku, Sonic by dreager1. Bookmark the permalink. nope unless sega wants to. Actually, Archie sonic solos the entire dbz universe as he can easily go many times the speed of light and can casually bust solar systems, at his base form. Going by game rules, sonic still wins as a kamehameha will only take Sonics rings and sonic can just stick to the one ring rule. But other version of sonic will be beyond annihilated by goku, along with the universe. 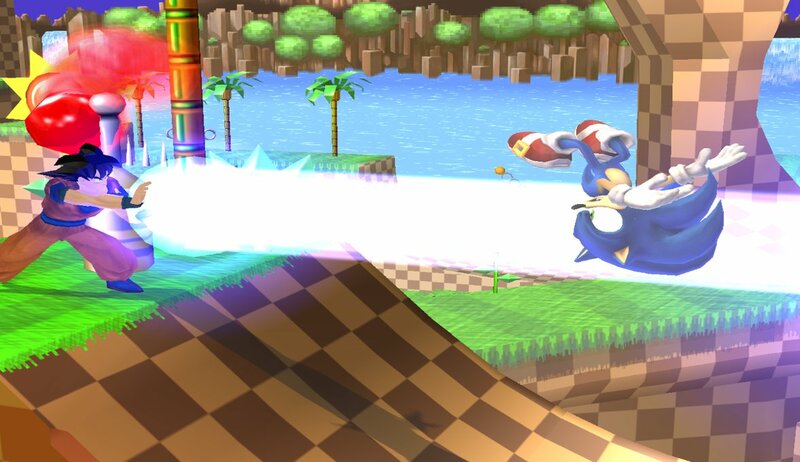 Though this sonic might stand a chance as he is clearly charging up a kamehameha of his own. Archie Sonic is tough and I won’t deny that he is massively FTL and a Solar System buster, (Although in base form that may be a stretch) but I would also say that Goku can match those feats. Goku’s Kamehameha would likely get rid of all of the rings that Sonic has at his disposal. The Kamehameha is insanely powerful and we also can’t underestimate Goku’s hand to hand skills, which definitely surpass Sonic’s. Solo a universe made of superbeings with messed up hair? C’mon. Well sonic was fighting shadow in the Archie comics, and though shadow might be able to bust solar systems at base form, he was using the chaos emeralds which, in the comics, is all you need to destroy a universe. Yeah, the Chaos Emeralds likely played a big part in that, although Shadow is definitely a powerful fighter. The Archie comics are definitely a lot of fun and I’ll be checking some out myself in a few months thanks to my library. It’ll be fun to relive the classics! Super Sonic is invicible nothing can harm him in any way what so ever. I’m not denying that Goku is strong as I am a HUGE DBZ fan (heck Goku is a Super Saiyan God for crying out loud) but what was said about Goku being faster is false because Sonic has a move called THE LIGHT SPEED ATTACK HAVEN’T YOU HEARD OF IT!? But no matter how powerful either one is Goku could not defeat someone wha can’t be harmed. Yes Super Sonic doesn’t last forever but neither does SSJ Goku. As for their normal states it might end in a tie. Also has anyone here seen Battle of the Gods or Played Sonic Adventure, Sonic Unleashed, or Sonic Generations? Goku lost to a God of destruction and Sonic DEFEATED 3 DESCUSION OVER! I’ll admit, your final point was a pretty good one. Super Sonic is said to be completely invincible, but Scourge has hurt him in the past so it’s tricky. Hopefully Goku’s new Super Super Saiyan God mode from the next film will be able to help you out there.